Last week’s Art Journal Adventure prompt was “Time”. Time is a major stressor for me because I am perpetually over-scheduled, often needing to be in two places at once, and because I am a control freak who is neurotically punctual. The conflict between those pragmatic and psychological states generates a whole load of mental exhaustion. And that is precisely why I thought of the White Rabbit. His being late has him strung out and fizzing with frenetic energy, so needing to propel himself that he is almost paralysed by how overwhelmed he is. I can relate. I went whimsical for this illustration. 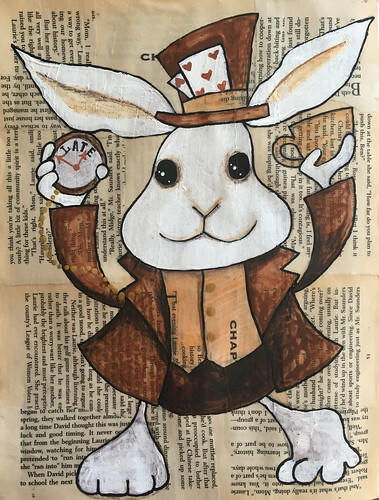 I used old book pages as my substrate since the White Rabbit is, of course, a book character. The brown hue of the paper then inspired the colour palette. I think he looks pretty cute and surprisingly relaxed and cheery for someone who is running so late for a very important date. His eyes are beady and the color of molasses and yet he does look happy about it. Thanks. My oldest son said the eyes were creepy. If that is the case, then I kind of like that the eyes offset the more cutesy vibe. I do like your rabbit. and like you I hate to be late. Thank you. Possibly, like me, you were taught that punctuality was polite. Being late makes me so anxious. Oh my gosh. Me too. I was once so extremely early for a teaching conference that the room wasn’t even set up yet. I ended up helping the hotel staff move furniture into the room and get everything ready. I share your anxiety about being late – i’m usually ridiculously early. I love your rabbit, though he doesn’t look as anxious as I get! Thank you. When I originally drew him, he definitely looked a tad more concerned. The layers of paint and ink must have become more curved and developed into a smile. I have a friend who is always ridiculously late and is not remotely phased by it so this rabbit is probably more akin to her than to me. I always think that’s saying “my time matters more than yours”. Very annoying! Haha, wonderful art! I’m an on-time person too.